This month I’ve been mostly in the Greenhouse or snuggled on the sofa with Mr Tiger Feet and small human watching an annoying noisy and slightly obnoxious pink pig on the tele box. 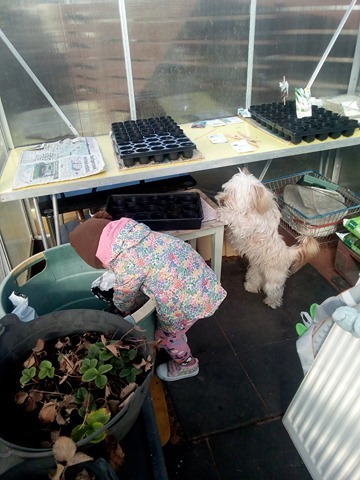 Greenhouse duties, I’ve been helping human and the small human on filling pots with compost and planting seeds. I’m told we’ve planted various vegetables and flowers…when actually small human planted a few more items when human turned her back and went outside to fill the watering can.